Video endoscopy aids in the diagnosis and treatment of problems occurring in the upper and lower gastrointestinal tracts. 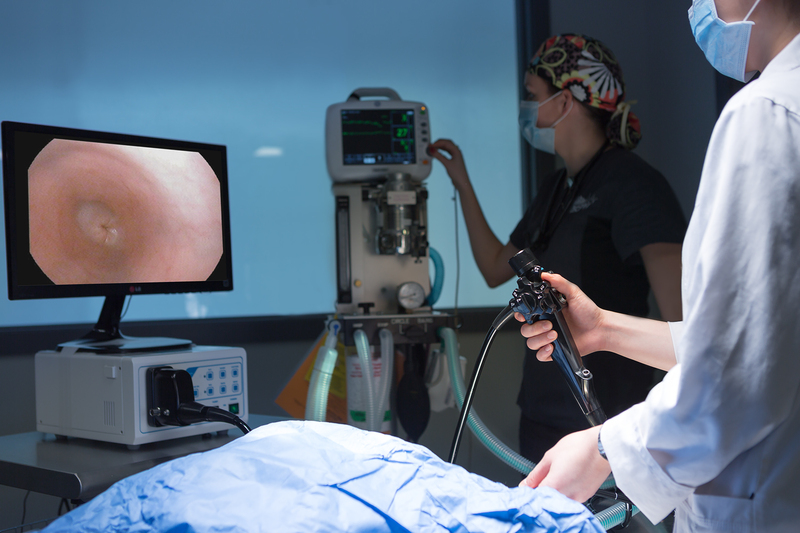 An endoscope allows a more complete examination of the esophagus, stomach, and some areas of the intestines as well as the ability to take tissue samples for testing and aid in the removal of foreign bodies and other blockages. Most importantly, an endoscope allows for examinations to occur quickly and without major surgery. AECFV performs endoscopy primarily for exploratory diagnostic purposes as well as foreign body removal. AECFV uses an Olympus flexible endoscope primarily for exploratory diagnostic purposes as well as foreign body removal. To further our scoping abilities we also have a bronchoscope and a gastroscope. 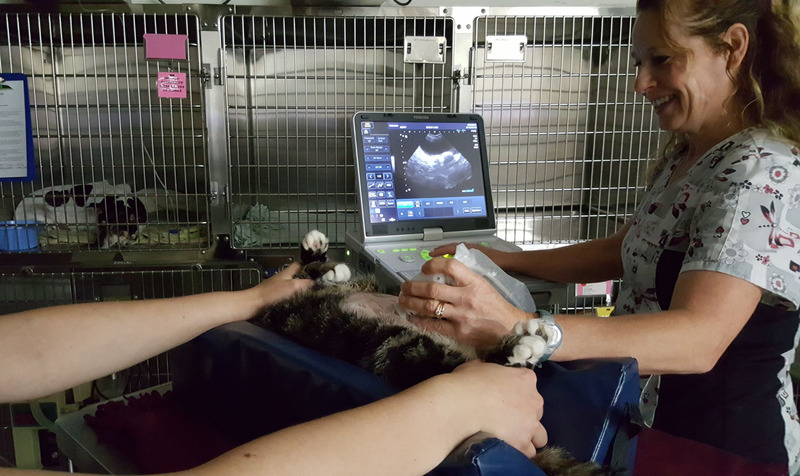 Ultrasound is a pain-free, totally non-invasive technique that uses high-frequency sound waves to produce a real-time image of your pet’s internal organs. Often considered more exact than radiographs, ultrasound provides a movie of what is happening inside your pet’s body. It is particularly useful in viewing your pet’s abdominal organs including the spleen, kidneys, liver, and gallbladder. It can also be used to evaluate heart functions, and perform scans of the bladder, thyroid, testicles and mammary glands. AECFV emergency doctors routinely perform abdominal and chest ultrasounds and are up-to-date on the latest procedures. In complicated cases, ultrasound studies can be quickly sent to a radiologist via telemedicine for further consultation. Radiographs (X-rays) are extremely important for diagnosing and monitoring many medical and surgical conditions. 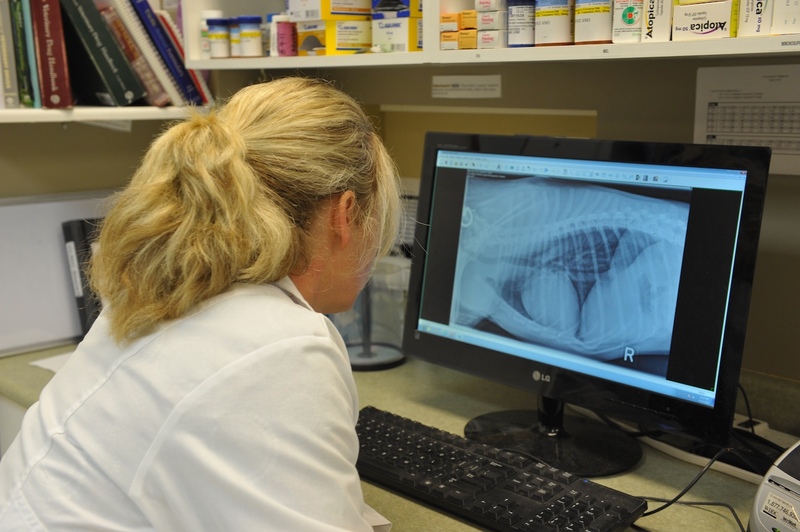 X-rays provide a view of your pet’s bones, lungs, heart, abdomen, oral cavity and other areas of the body in order to help us spot a fractured bone, internal injuries, diagnosis heartworm disease, or locate an obstruction or foreign body in your pet’s intestine or stomach. AECFV utilizes the latest in digital radiography equipment by Sound-Eklin. We are also up-to-date on the latest radiographic procedures. Because we offer digital radiography, our X-rays can be easily sent for second opinions with other radiologists in complicated cases. CT scanning, or computed tomography, creates high-resolution images of your pet. It is one of the best diagnostic imaging tools available and we are very excited to be able to offer the service to our clients and patients. The results are especially useful for detecting small masses and fully assessing damage in trauma situations, both of which may not be visible on conventional radiographs or ultrasound. 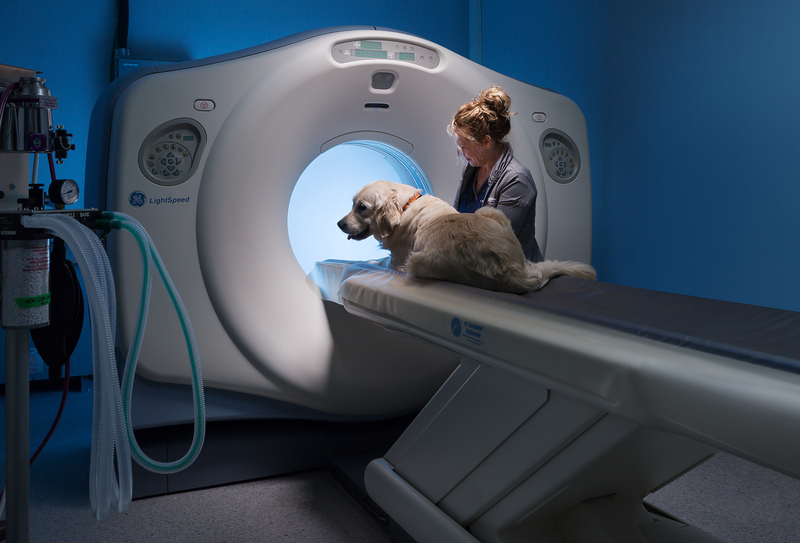 The CT scanner is a ring-shaped apparatus that rotates around your pet. With CT imaging, the computer builds an image of your pet and the entire image can then be manipulated in different ways, allowing for a truly comprehensive examination of all internal body structures. The detailed images that a CT scanner produces help us achieve the best and quickest diagnosis possible. This advanced diagnostic technology greatly enhances the level of service and quality of treatment we can provide to your pet. It is also one of the many ways we work to fulfill our commitment to you to protect your pet’s health so both of you can enjoy the longest, happiest life together possible.